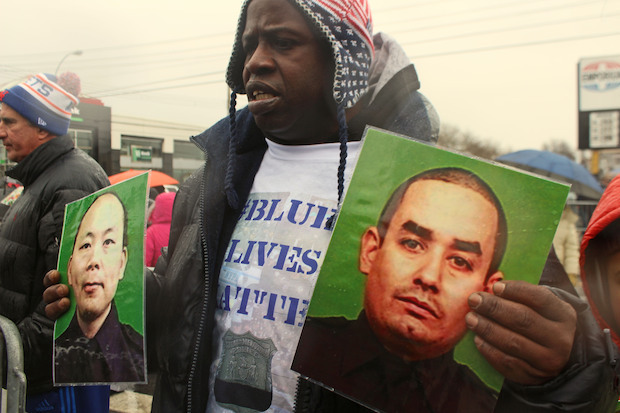 DYKER HEIGHTS — Police Commissioner Bill Bratton asked NYPD officers to be respectful as the city prepared to mourn fallen detective Wenjian Liu at his wake and funeral this weekend. In a memo sent on Friday, Bratton slammed officers who showed "disrespect" by turning their backs on Mayor Bill de Blasio during last weekend's funeral for Rafael Ramos, who was killed alongside Liu in a Dec. 20 ambush as they sat in their patrol car in Bed-Stuy. "A hero’s funeral is about grieving, not grievance," Bratton said in the memo, which came amid continuing tensions between the police unions and de Blasio over the death of the officers. Hundreds of people attended Saturday's wake for Liu, 32, a Gravesend resident who had been an NYPD officer for seven years and had just gotten married two months before he was killed. Even more people were expected to turn out for his funeral on Sunday. On the blocks surrounding Aievoli Funeral Home, at 1275 65th St. in Dyker Heights, locals hung handmade posters supporting the NYPD on lampposts and street signs, along with blue ribbons made from police tape. A group of police officers, grieving relatives and residents slowly gathered by the funeral home late Saturday morning, as snow began to fall. De Blasio stopped by the wake shortly after 1 p.m. Officers standing at the door to the funeral home saluted him as he entered, and he emerged about 15 minutes later with Bratton at his side. The mayor and police commissioner hugged, and then de Blasio got into a car and drove away. Gov. Andrew Cuomo attended the wake later in the afternoon and spoke briefly with reporters afterward, urging New Yorkers to set aside their differences and join together to mourn Liu and Ramos. "What makes New York strong is we take our diversity and we make it a strength, not a weakness," Cuomo said. "We have to come together as a family." The NYPD shut down nearby streets to accommodate the crowds that turned out to honor Liu, who was described by relatives as a devoted husband who was looking forward to starting a family. Liu immigrated to the United States from China in 1994 and used his language skills in his work for the NYPD, relatives recalled. His funeral took additional time to organize because many of his family members are still in China and needed to travel to New York. Felder Charbonnet, 42, a former member of the U.S. Navy's military police who lives a few blocks from the funeral home, planned to attend Liu's wake on Saturday afternoon even though he'd never met the detective. "Anytime something like this happens, whether it's police or military, you're always going to feel a connection," Charbonnet said. "It's a service where you put your life on the line... It takes a special breed." Some of the police who attended Liu's wake traveled thousands of miles to be there, including 20 officers from the LAPD. "For a lot of people across the country, it struck a chord, as all police deaths do," said LAPD Lieutenant Steve Lurie, 43, who was born in New Jersey. "Especially the manner in which it happened, and at a time when there's a lot of anti-police sentiment across the country. It's especially important to show up and support." De Blasio plans to speak at Liu's funeral on Sunday, according to reports. Bratton clearly did not want to see a repeat of police officers' protest of de Blasio at Ramos' funeral, which Bratton said in his memo "stole the valor, honor, and attention that rightfully belonged to the memory of Detective Rafael Ramos’s life and sacrifice." "I issue no mandates, and I make no threats of discipline," Bratton concluded his memo, "but I remind you that when you don the uniform of this department, you are bound by the tradition, honor and decency that go with it." Some police union leaders responded by saying officers can decide on their own whether to protest the mayor at Liu's funeral, according to reports.